HomeThe Ancestry of Samuel Ballard of Cherokee Nation West (c. 1802-1862). Cherokee Territory c. 1830 is the area identified as No. 36. Note that it includes parts of Georgia, Alabama, Tennessee and North Carolina. Researching the Cherokee Ballard lines has proven to be an interesting proposition. In some corners, there is a wealth of information, in others, a yawning chasm. To appreciate the full story, one must understand the saga of the five tribes, and in this instance, the Cherokee Nation, and the shameful history of the notorious Trail of Tears, which at least provides specific movement of the families whose history we seek to reveal. The purpose of this project is to determine which Ballard families intermarried with members of the Cherokee tribe prior to 1850 in the Southern United States. Our goal is to document which branch or branches of the Ballard family intermarried with Native Americans so we can properly place those descendants who participate in the Ballard yDNA Project. Later Native American generations are extremely well documented because of the Federal government’s practice of taking an annual census from 1885 to 1940, so we won’t concern ourselves with them (for now). Today we focus on Samuel Ballard, Sr, a white American who joined the Cherokee and lived in the Cherokee Nation in Georgia, took part in the Trail of Tears, and left descendants in Oklahoma. We will work back from him to show his likely ancestry. Essentially – Indians living on reservations generally were not enumerated — though there are rare exceptions, with variations in each census. Prior to 1860, generally speaking, Native Americans were not enumerated. Recall the original purpose of the census, which is to count all citizens to determine representation in Congress. We did find, however, that Samuel Ballard, age 58 (born c. 1802), a farmer, born in Tennessee, was enumerated in the 1860 US Federal Census in the Koo wee Skoo wee District, Indian Lands, Arkansas (this was prior to the organization of the state of Oklahoma, which occurred in 1907. 1860 US Federal Census, Koo wee Skoo wee District, Indian Lands, Arkansas, Roll M653_52, Page 1174, Image 702. 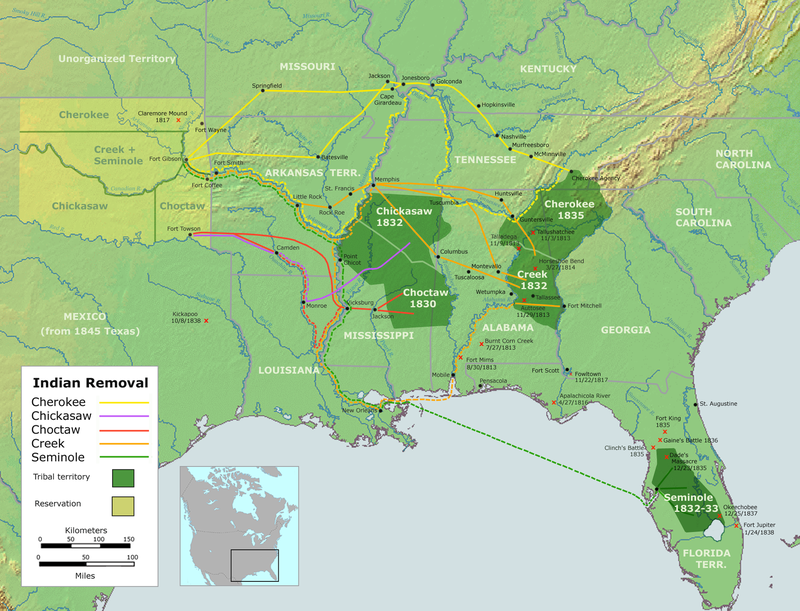 Trail of Tears Map, Showing Indian Removals, 1830-1838. We have evidence of Samuel Ballard’s activities during the Trail of Tears from contemporary correspondence of the military personnel responsible. From Correspondence on the Subject of the Emigration of Indians Between the 30th November, 1831 and 27th December, 1833 (Washington: Duff Green, 1834). Office Commissary General Subsistence, August 17, 1833. SIR: Yours of the 12th July is received, together with your accounts for the second quarter 1833. You state that, in consequence of a request of General Gratiot, you proceeded to Red river to pay a few individuals moneys due them on account of improving the navigation of that river, and “whose accounts could not be settled without your presence.” That, being on board the Lioness steamboat when she was blown up, you lost, among other money “two hundred and forty one dollars and seventy-eight cents of the money for the removal and subsistence of the Indians,” and you say you are not willing to lose this amount, unless I am of opinion that the loss should be your own. It is very sure that you are charged with a certain sum of the public funds, and that you cannot be released by this department, except through the medium of your expenditures. No power short of Congress can give you relief on the score of your having sustained a loss. You will not hereafter leave the neighborhood of the tribe unless with the sanction of the department. Mr. Currey informs me that Samuel Ballard and John Rogers, two white emigrants at the head of Indian families, have returned to the old nation. You report having made over issues to several persons in consequence of Captain Vashon’s statements not agreeing with Mr. Currey’s muster-roll, which latter was not furnished to you until after the issues were made. The cost of the over-issues must be stopped by Captain Vashon from any moneys to which those persons may be entitled. Hereafter, take the pre caution to make no issues except upon Mr. Currey’s roll, a copy of which Captain Vashon should hand over to you as soon as received. He will be requested to do so. Respectfully, &c., GEO. GIBSON, C. G. S.
Disbursing Agent Cherokees West, Fort Gibson, A. T.
CHEROKEE AGENCY, July 11, 1833. The War Department having, under the directions of the President, ordered the opening of books, and authorized the Governor of Georgia to appoint two persons to aid me in enrolling the names of such as give their assent to a treaty on the terms heretofore proposed to the Cherokee people, as well as to send off such of the reservees under the treaties of 1817-19, as are ready to remove, a disbursing agent will be required to meet the requisitions necessarily attending the progress of these measures. Whether this disbursing officer shall only pay out moneys, or whether he shall attend generally to transportation and subsistence, has been a matter of doubt. Will you be so good as to decide the question, and give instructions accordingly? For this station, would it not be well to despatch an officer whose views are known to accord with those of the Executive of the United States? The assistant enrolling agents are to be on a per diem allowance of $4, besides their expenses: they will each be furnished an interpreter at $2 50 r day. The superintendent will also have an interpreter, employed at the same allowance. Whether any, or what number of the reservees will remove shortly, is uncertain; but there are some families in the nation, who, under former enrolments, have signified a wish to remove early in the fall. Samuel Ballard and John Rogers, two white emigrants at the head of Indian families, having returned, in violation of their engagements, will be proceeded against as directed in similar cases hereafter. Gen. GEORGE GIBSON, C. G. S.
Samuel Ballard appears on the 1835 Henderson Roll, which was a census of the Cherokee Nation in Georgia. 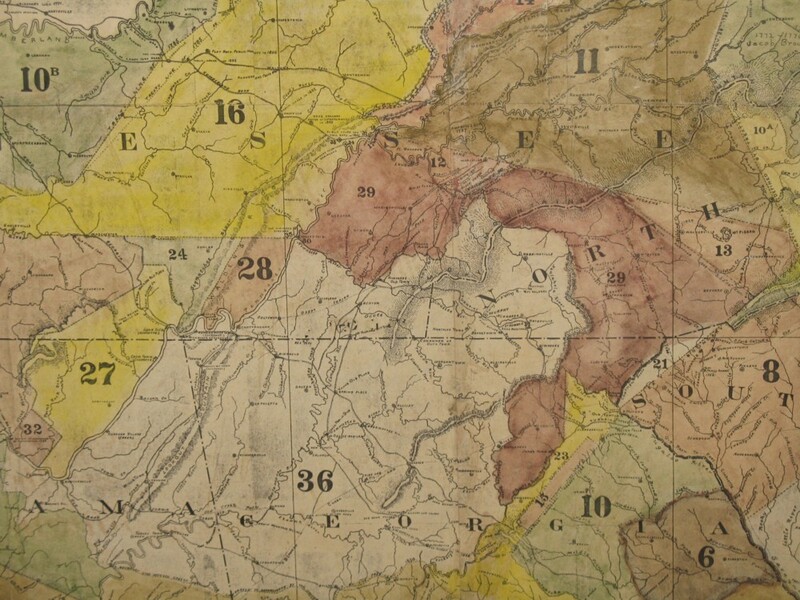 That census shows Samuel Ballard at Red Clay in McMinn County, Tennessee; Red Clay was the site of the last seat of Cherokee national government before the 1838 enforcement of the Indian Removal Act of 1830. The Cherokee government moved there after being forced out of New Echota, Georgia. The 1838 Muster Rolls, part of the collection of the National Archives Cherokee Emigration Rolls, 1817-1838 (specifically, in this instance, the Muster Roll of B.F. Currey (Benjamin F. Currey), are lists compiled by those completing the removal of the Cherokees. The Muster shows Samuel Ballard’s household consisted to two males under age 25, two females under age 25, and one male over age 25. Eastern Cherokee Applications of the U.S. Court of Claims, 1906-1909, were applications for shares from a fund appropriated by Congress in 1906 in favor of the Eastern Cherokee. Applicants provided extensive information about their families to support their claim, which is a gold mine of information about these families. Below is transcribed that of Thomas Ballard, one of the sons of Samuel Ballard. Lines left blank are omitted. Commissioner of Indian Affairs, Washington D.C. I hereby make application for such share as may be due me of the fund appropriated by the Act of Congress approved June 30, 1906, in accordance with the decree of the Court of Claims of May 18, 1905, and May 28, 1906, in favor of the Eastern Cherokee. The evidence of identity is herewith subjoined. 9 Name and age of wife or husband: Susan Ballard, 45 white. 10 Give names of your father and mother, and your mother’s name before marriage. 11 Where were they born? 12 Where did they reside in 1851, if living at that time? 18 Where did they reside in 1851, if living at that time? Grandmother lived in Delaware Dist, Cher. Nation. 19 Give names of all their children, and residence, if living; if not living, give dates of death. [Note:there appears to be confusion in filling out the form, with names listed consecutively, ignoring the requested information of English name, Indian name, Residence]. 20 Have you ever been enrolled for annuities, land, or other benefits? If so, state when and where. 1851-1874 Delaware Dist. 1880, Illinois Dist. (1883-1886, 1890 [illegibile] 1893. Illinois Dist. Appl for [illegible] 1904. 21 To expedite identification, claimants should give the full English and Indian names, if possible,of their paternal and maternal ancestors back to 1835: Alex Drumgool, Grandfather; Calomasky (?) Drumgool Grandmother, Samuel Ballard (white man), Sarah Drumgool Ballard. I am doing the best I can to make out my claim. These are the only “strain list” (?) [illegible] that I know. NARA M1104. Eastern Cherokee Applications of the U.S. Court of Claims, 1906-1909, Application No. 1056. Note that Thomas did not know where his father came from while his mother came from Georgia, yet later generations state that Thomas came from Tennessee. Could they have derived that information from the fact of temporary settlement in Tennessee following the tribe’s removal from Georgia? William Ballard was born at Whiteoak, 18 miles South of Tahlequah, in 1876. He is a ½ blood Cherokee Indian. His father’s people came from Tennessee, his mother’s people from North Carolina. They came by wagon train drawn by oxen and horses. His grandmother died on the way and a grave was dug a few yards from the road. Where she was buried, the grave marked by a stone with no inscription. None of his people took part in the run of 1889. His ancestors were farmers and hunters, also fishermen. Two interviews were conducted in 1937 and 1938 with Elizabeth Ballard Sanders, the daughter of Thomas Ballard whose Application to the U.S. Court of Claims appears above. Curiously, in the first interview (in 1937) she states that Thomas (whose family came from Tennessee) ran away when he was 16 and joined the Union Army, while in the second (in 1938) she states that he joined the Confederate Army at the age of 17. I was born January 19, 1868 in the Cherokee Nation in what was known as the White Oak settlement, nine miles East of Braggs, I.T. My mother’s people came here from Tennessee with what was known as the first settlers. My great-grandmother died on the way over here. My grandmother was only nine years old at the time. She (Betsy Riley Romine) and her father came on alone. She grew up and married Wright Romine who was my mother’s father. He died and she later married Jacob Bushyhead, an uncle of Chief Dennis Bushyhead. My father’s people came here from Tennessee also, but they came later as emigrants when the Indians were driven West. My people were not full bloods. There was some white blood in the family, but I don’t know just what per cent. My father, Thomas Ballard, ran away from home when he was 16 years old and joined the Northern Army and fought in the Civil War. I can just remember hearing him say he fought in the Battle of Bull Run and that of Bunker Hill. They are the only battles I can remember hearing him mention. He and my mother were married after the war was over in 1865. My grandparents on my mother’s side were Wright Romine and Betsy Riley. Grandfather was an Irishman who came into the old Cherokee Nation in the early days and married my grandmother, a half breed Cherokee. They started westward with the first colony of Cherokees, known as “old settlers” in 1834. As they were crossing the Mississippi river on a ferry boat, my grandmother (Betsy Riley Romine) died. My mother was a small child and never had any very distinct recollection of her mother but said she well remembered after her mother’s death that they opened a large chest that contained her clothes and she saw a lot of gold money in the chest. They halted on their journey and buried her beside the river. Her sister, Mrs. David Carter and her husband who were in the party took charge of my mother and reared her. When they reached their destination they located in the vicinity that was afterward known as Park Hill, near Tahlequah. Grandfather (Wright Romine) was a large slave owner and had brought his slaves with him. With the help of the Negroes they erected comfortable log houses in which to live and house the Negroes. When the Cherokee Female Seminary was established in 1846, mother (Caroline) was enrolled in the first class. Mrs. Jane Ross, niece of Chief John Ross, was one of the teachers. Martha Schricmaher, mother of Mr. William Gulager, was a classmate. I have heard my mother relate many amusing and unusual incidents that occurred during her childhood in a new country. One was when the children killed a sheep. Her uncle David Carter raised sheep as did many of the Cherokees. In the herd was a ram that would chase the children whenever he saw them and they had been warned against him. One day he attacked them and my mother did not run and when the ram came in reach she grabbed him by the horns and gave his neck a twist and he fell to the ground. Another child ran for the ax and they chopped his head off. At the beginning of the Civil War, all of the slaves owned by her uncle ran away one night and as that left them entirely without servants much of the heavy work devolved upon her. As she was not accustomed to it, it was very distasteful. Later her uncle’s family refugeed to Texas as did many of the Cherokees. Mother did not go but preferred to stay with friends and other relatives. My father, Thomas Ballard, a ¾ Cherokee Indian, joined the Confederate Army at the age of 17 and served under General Stand Watie. His Captain’s name was White Catcher. He participated in the Battle of Pea Ridge and all the skirmishes in that section of the country. After the war was over he met and married my mother, Caroline Romine. They established their new home in the Cookson Hills two miles from the Illinois courthouse. I was born there January 19, 1868. Jack Cookson for whom the community was named was one of our neighbors, a highly respected man and a leader in the community. Mr. Cookson operated a general store and cotton gin at Garfield. His son, Levi Cookson served several years as a member of the Cherokee council. Tom Madden who married my sister, was a pardner in business with Mr. Cookson. My father engaged in farming and stock raising. The chief source of his income was from cattle which were no great expense to raise as the range was fine and free. And finally, records of the Confederate Army show that a Sam Ballard was a member of the 2nd Cherokee Mounted Volunteers. A Company Muster Roll for the period September 30 to July 14, 1863 records that Sam Ballard “Died Dec 1862 in prison.” Some researchers may have taken this as proof of the death of the elder Samuel Ballard, who would have been 60 years of age in 1862. We believe this records the death of Samuel, Jr., for the first conscripts in the war were between the ages of 18 and 35; it was not until later in the conflict that older (and younger) men were pressed into service. The claim record transcribed above does give 1862 as the year of the death of the elder Samuel Ballard, though we have not been able to corroborate the information with another record. Several online sources give a date of death of the elder Samuel as 16 March 1863, but again we have not been able to corroborate this with a primary record. In order to try to pinpoint the senior Samuel Ballard’s ancestry, we return to where we began — the 1860 Federal Census, in which he states he was born in Tennessee. Having joined the Cherokee Nation, he would have had contact with them and their lands in Southeastern Tennessee, so we began our search there. Not having access to local records, we enlisted the services of Amy Mays Emert, a professional genealogist in Powell, Tennessee, close to Knoxville with easy access to the Knox County Archives and the McClung Collection, a repository with many records for the region. The court records reveal some interesting interactions with neighbors. Court cases occurred in two courts: Circuit, and Pleas and Quarter Sessions. In some cases the case files were too large to copy; in others the document was damaged and illegible, or even empty. Ms. Emert provided a summary of the larger cases; transcribed below are the more interesting cases. The grand jurors for the State impanneled sworn and charge to enquire for the body ot the County of Knox upon their oats do present that a certain John Dudley late of the County aforesaid Laboror on the _____ [blank in original] day of June 1812 with force and arms attorned in the County aforsaid in and upon the body of one Rebeckah Ballard in the peace of the state than and there being an assault did make and her the said Rebeckah Ballard did then and there beat, wound, and ill treat and mur [illegible] then and said [illegible] Rebeckah Ballard to the great [illegible] of her the said Rebeckah Ballard to the evil example of all like offenders and against the peace and dignity of the state. Knox County, TN Court of Pleas and Quarter Sessions (Rebecca Ballard vs. John Dudley) Docket #3166/365, Box 3B, July Session 1812. A similar complaint was made by a Patsy Ballard who was also assaulted by John Dudley. In retaliation, Samuel Ballard, Sr, his sons Samuel Ballard, Jr and James Ballard beat up John Dudley and threw stones at his house. Personally appeared John Dudley before me Robert Lindsay a Justice of the Peace in and for said county and being duly sworn on the Holy Evangelists of Almighty God to speak the truth the whole truth, and nothing but the truth. Saith that on the night of the 9th last at his house in the county aforesaid, Samuel Ballard and his two sons viz. Samuel & James with sundry other persons to him unknown did make an assault on his house and on his person, and him the said John Dudley died beat bruise would & ill treat by throwing stones at him & at his house in a most violent manner, and did break open his window & throw in stones thereat to the great terror & danger of his family. Whereas complaint hath been made this day oath by John Dudley to us Robt Lindsay one of the Justices of the Peace in and for sd county, that on the night of the Ninth inst. at the house in the county aforesaid Samuel Ballard and his two sons viz Samuel & James with sundry other persons to him unknown did make an assault on his house and on his person and him the sd John Dudley did beat, bruise, wound & ill treat in a most violent manner by throwing stones at him & at his house & breaking open his window and throwing in stones thereat to the terror and great danger of his family — There are therefore in the name of the State to command you forthwith to apprehend the sd Samuel Ballard & his two sons Samuel & James Ballard and bring them before some Justice of the Peace for sd. county to answer to the above complaint & be further dealt with as the law directs. Given under my hand & seal this 10th day of November one thousand eight hundred & twelve. Samuel, James and Rebecca Ballard were involved in another legal scrape in 1819, in which they were accused of beating and bruising John Low at their house. Knox County, TN Court of Pleas and Quarter Sessions (John Low vs. James, Rebecca and Samuel Ballard), Docket #3527 & 3528, Box 3D, 16 February 1819. James Ballard was again called before the Court in July 1819 for pulling a gun on the County Constable. Knox County, TN Court of Pleas and Quarter Sessions (State of TN vs. James Ballard, Docket # 3529, Box 3D, 19 July 1819. In 1823, a Mourning Ballard is called before the Court on the charge of Bastardy; in the record she names Isaac Bond as the father of the child. Knox County, TN Court of Pleas and Quarter Sessions (State of TN vs. Mourning Ballard) Docket # 6318/841, Box 4D, 12 December 1823. James Ballard was yet again in court in 1829 for assaulting William Scott. Knox County, TN Court of Pleas and Quarter Sessions (State of TN vs. James Ballard), Docket # 7263/1086, Box 4I, 23 September 1829. Deed books and tax records reveal additional relations. On 25 October 1838, Samuel Ballard purchased 100 acres of land on the Holston River from D and M Shields & Company. Knox Co. TN Warranty Deed Books, Book B, Vol. 2 (February 1838-March 1839), recorded 12 November 1838. Two years later on 22 April 1840, Samuel conveyed this land to Matthew Ballard. Note that a wife did not join in the conveyance or relinquish dower. Knox Co. TN Warranty Deed Books, Book D, Vol. 2 (March 1840-February 1841), recorded 26 April 1840, pp. 48-49. On 25 April 1840, Samuel conveyed personal property to Leroy Carpinter and Thomas Scott — “hath this day bargained sold and conveyed the following … one young bay hourse about five years old, one roan mare, one mans new saddle and riding bridle, one blind bridle one pair of harness chains …” Knox Co. TN. Warranty Deed Books, Book D, Vol 2 (March 1840-February 1841), recorded 15 June 1840, pp. 110-112. A tax list for the year 1842 shows three male Ballards in District No. 11 of Knox County; Andy Ballard (Andrew) is shown with 100 acres of land, valued at $225; the next on the list is Sam’l Ballard, with no land or value next to his name, followed by Mathew Ballard, also with no land or value next to his name. While Matthew Ballard legally held title, the fact it was listed this way suggests they were viewed as a family unit and were a single household. Ancestry Tennessee Early Tax List Records, 1783-1895 (database online). Federal Census records help us understand Andrew and Matthew, while James, for now, remains a cipher and the subject of additional research. Andrew Ballard, born c. 1813, is believed to be the Andrew J. Ballard who married Nancy Franklin 22 April 1837 in Knox County. They and their children were enumerated in the Knox County Federal Census in 1840, and in Blount County, Tennessee in 1850, 1860, 1870, and back in Knox County in 1880 (Nancy died between 1870 and 1880). Their children were: 1. Nancy Ann, b. 1840; 2. Louisa, b. 1842; 3. Samuel, b. 1844; 4. Whitson, b. 1846 (“Whitfield” in the 1850 Census); 5. Rebecca, b. 1849; 6. Berthina, b. 1856; 7. Mary, b. 1859; 8. Naoma, b. 1864. It’s worth noting that the 1880 Census indicates that Andrew’s father was born in Virginia. Matthew Ballard, born c. 1821, on 25 April 1846 married Susan Jane Lawhorn (certificate). Curiously, the 1850 Federal Census lists his place of birth as “Not Known,” but in subsequent enumerations he listed Tennessee. He was not consistent with reporting his age; in 1850, the Census records 24 (born c. 1826); in 1860, 38 (born c. 1822), in 1870, 50 (born c. 1818) in 1880, 59 (born c. 1821). He and Susan had one daughter, Rebecca, born c. 1848. Circuit Court June Term, Eighteen Hundred and Forty-four. The Grand Jurors for the State of Tennessee, being duly summoned, elected, empannelled, sworn and charged to enquire for the body of the county of Knox within the State aforesaid upon their oath present that Jame Ballard, Matthew Ballard, Andrew Ballard, Israel Scott and James Nipper, late of said county, laborers, on the ninth day of June eighteen hundred and forty-four, with force and arms, in the county aforesaid, unlawfully, riotously and routously* did assemble and gather themselves together to disturb the peace of the state aforesaid, and being so assembled and gathered together, in and upon one Milly Hensly, in the peace then and there being unlawfully, riotously and routously did make an assault, and the dwelling house of the said Milly Hensley, with force and arms, riotously routously and unlawfully did then and there begin to pull down and did then and there unlawfully riotously and routously batter the walls of the said dwelling house of the said Milly Hensley, she, the said Hensley, being then and there in the said dwelling house and did then and there pull down the chimney to the said dwelling house in a riotous and unlawful manner to the evil example of all like offenders and against the peace and dignity of the state. Knox Co. TN Circuit Court (State vs. James, Andrew and Matthew Ballard), Docket #3422, Minor #2471, Box 25 (June Term 1844). What of the Other Samuel Ballards in Tennessee? Census and other records show two other Samuel Ballards residing in Tennessee in the 19th century. There was a Samuel Ballard born in 1816 who on 26 August 1841 married Nancy Scott (1817-1885) in Knox County. We have not yet determined who his parents were, but the circumstances show that he was not the son of Samuel Ballard, Sr. Since he was born well after the 1812 court case naming Samuel Sr and his sons Samuel Jr and James in the altercation with John Dudley, we can comfortably eliminate him as that Samuel. In 1850 the family resided in Knox County, and in 1860 in Blount County. Samuel and Nancy are interred in Mount Moriah Cemetery in Blount County; Samuel died 12 June 1865, and Nancy Scott on 3 July 1885. Their children were: 1. Marcus, b. 1843; 2. Samuel, b. 1845; 3. Mary, b. 1849; 4. Martha, b. 1850; 5. Nancy, b. 1852; 6. William, b. 1854; 7. Ann, b. 1857. We believe this Samuel is a relation of the other Knox County Ballards (perhaps a son of Samuel’s son James; the 1800 Federal Census for Buncombe County, North Carolina shows Samuel with two sons born between 1790 and 1800), but we have not yet determined where he fits in. Another 19th century Samuel Ballard resided in Memphis, Tennessee. His obituary appeared in the Memphis Daily Appeal Tuesday, 21 April 1857 (p. 3), and shows he was a native of Baltimore, Maryland. Probate records accessed via Ancestry do not show that he had any descendants, though he left behind many creditors. The remains of the deceased will be removed to Somerville this morning, there to be interred by those of his wife. The deceased, we believe, was a native of Baltimore, but from early manhood, has been a citizen of West Tennessee and was, at the time of his death, Collector of Customs at this port. He possessed a warm and genial nature, and has left behind him troops of devoted friends to mourn his death. Where Did Samuel Ballard of Knox County Come From? There are two participants in the Ballard DNA Project who descend from Samuel Ballard, and are part of Lineage Group I. This group is comprised of descendants of Thomas (c.1717-1781) and John Ballard (c.1719-1780) of Albemarle County, Virginia, Bland Ballard (c. 1713-1791) of Spotsylvania County, Virginia, and Richard Ballard (c. 1692-c. 1779) of Essex County, Virginia. Some researchers claim that these men descend from Thomas Ballard of James City, Virginia (1630-1690), but participants in other lineage groups (which are genetically unrelated) claim descent from him as well. Neither group has presented sufficient evidence to prove this descent (to the satisfaction of this researcher), so the ancestry of these men further up the line remains unsettled in these pages. Item I give and Devide to my sons Thomas Ballard & Bland Ballard and their heirs for ever all this my land they suffering my daughter-in-law, Mourning Ballard to live on, use and occupy that part of it whereon she now lives during her natural Life and I will and …. the land to be equally divided between them so that Bland enjoy that part whereon he now lives. Recorded Buncombe Co. North Carolina Deed Book 3, p. 198. Samuel Ballard and John Ballard both appear in the 1800 North Carolina Federal Census as being 26 to 45 years of age. Also in Buncombe County appears “a deed or letter of Attorney from John Ballard to Robert Patton for all that part of his father John Ballard’s estate that was bequeathed to him by the last will of John Ballard, deceased, was proved in open court by the Reverend George Newton, One of the subscribing witnesses thereto, and ordered to be registered.” January Court 1800, Buncombe Co. N.C. Probate of Deeds, p. 98. Samuel. Born c. 1770, Samuel Ballard removed from Albemarle County, Virginia to Rutherford, North Carolina before 1790, where he appears on the US Federal Census that year and is enumerated as a male over age 16 (born before 1774) in a household that includes two females. 1790 US Federal Census, Rutherford, North Carolina, Series M637, Roll 7, Page 133, Image 85. He must have settled in that part of Rutherford that was cut off (along with part of Burke County) to form Buncombe County in 1791, for in 1800 he is enumerated in Morgan, Buncombe County as head of a household with a wife of approximately the same age (between 26 and 44), two sons under age 10, a daughter between 10 and 15, and two daughters under age 10. 1800 US Federal Census, Morgan, Buncombe, North Carolina, Series M32, Roll 29, Pag 163, Image 108. Samuel’s brother John Ballard is also found in Morgan, Buncombe, North Carolina in 1800. The Federal Census that year enumerates a male head of household age 26 to 44, and the household includes a female age 16 to 25, two males under age 10, three females under age 10, and one female over age 45 (born before 1755). We are inclined to believe that the older female is Mourning, John and Samuel’s widowed mother. 1800 US Federal Census, Morgan, Buncombe, North Carolina, Series M32, Roll 29, Page 160, Image 105. As noted above, on 20 December 1793, Samuel Ballard executed a quitclaim deed for his interest in his father’s estate to Robert Patton that was recorded in Buncombe Co. N.C. Deed Book 3, p. 198. In 1799 (the deed fails to name the month: “This indenture made the 29th day in the year of our Lord one thousand seven hundred and ninety nine …” Samuel Ballard purchased from James McMahan “a certain tract of land lying and being in the county of Buncombe on a creek called Forgey’s Creek of Swanannoa …” (100 acres). Recorded Buncombe Co. N.C. Deed Book 3, p. 317, and acknowledged in January Court 1801 and recorded. Buncombe Co. N.C. Probate of Deeds, p. 135. This same 100 acre parcel was sold by Samuel Ballard to William Edmunson (Edmundson) on 16 July 1802, recorded Buncombe Co. N.C. Deed Book 7, p. 285, and acknowledged October Court 1802. Buncombe Co. N.C. Probate of Deeds, p. 205. Note that no wife joined in the conveyance; could she have died between 1800 and 1802? No Samuel Ballard is found in North Carolina in the 1810 Federal Census, but a Samuel Ballard appears on a tax list dated 1805 in Anderson County, Tennessee. We believe that after selling his North Carolina land, Samuel Ballard removed to Anderson County, Tennessee. Unfortunately Anderson County lost its Federal Census records for 1810 and 1820, so verifying this is problematic and we turn to the court records for additional information, and are amply rewarded with tales of mayhem. John. A John Ballard on 25 November 1798 purchased from Joseph Dodson 200 acres on Bold Mt. Creek. Recorded Buncombe Co. N.C. Deed Book 3, p. 246. On 10 June 1805, John Ballard conveyed 50 acres on Ball Mountain Creek to a Richard Ballard. Recorded Buncombe Co. N.C. Deed Book 10, p. 336. We do not know the relationship of the John to Richard; likely father and son. Richard Ballard purchased 238 acres on Bald Mountain from John Strother et. al. on 24 October 1805, recorded 1 April 1807 Buncombe Co. N.C. Deed Book A, p. 153. “Thomas Ballard, son of John, Albemarle. £7.9.0 by account. He removed to North Carolina during the time the Convention Troops of Gen. Burgoyne were stationed in Albemarle, which must have been about 1779 or 1780. He carried with him some slaves and other property and was generally reputed solvent. He lives near the hanging rock in North Carolina. Thomas Ballard of Albemarle is an uncle of Thos. Ballard, son of John.” British Mercantile Claims (cited in The Virginia Genealogist, Vol. 29, No. 4, p. 299). On 1 August 1816 a Thomas Ballard purchased 290 acres on French Broad River from Jerremiah R. Pace. Recorded Buncombe Co. N.C. Deed Book 11, p. 63. On 25 December 1820, Thomas Ballard conveyed 50 acres on French Broad River to Charles Stewart. Recorded 23 December 1831 Buncombe Co. N.C. Deed Book 16, p. 392. We believe, based on the evidence above, the fact that we can account for the other Samuel Ballards living in Tennessee in this time frame, and yDNA evidence, that the Samuel Ballard born c. 1802 in Tennessee who joined the Cherokee c. 1830 and ultimately removed to the Indian Territory in what is now Oklahoma (and died, according to his son’s application to the U.S. Court of Claims cited above, in 1862, though several online sources state he died 16 March 1863, but do not provide the source of this information) is the son of Samuel Ballard (c. 1770-aft. 1840), who removed from Virginia to Buncombe County, North Carolina, then to Knox County, Tennessee, and who was, in turn, the son of John Ballard (c. 1738-c. 1779) of Albemarle County, Virginia, the son of Thomas Ballard (c. 1717-1782) of Albemarle County. We’ve seen no evidence of the name of Samuel, Sr’s wife. Recall that when he sold land in Buncombe in 1802, no wife joined the transfer to relinquish her dower interest (and no wife joined in the conveyance by Samuel to Matthew Ballard in 1840), but if living, she may have been named in one of the Knox County court cases, or if deceased, then all of the females named in those records were probably his daughters. An educated guess would be that her name was Rebecca, and perhaps the Rebecca named in the cases was his wife, given that the name is in his household, and his sons Andrew and Matthew named daughters Rebecca. Yet we know from Census records that Andrew and Matthew were born after 1802; could it be that she was still living, and the legal formality of dower release was ignored or overlooked? If she died, was there another wife? Nevertheless, his likely children (in no particular order) are: Rebecca; Patsy; James; Mourning; Samuel, Jr.; Andrew; Matthew. There are still more details to fill in to tell the story about the Ballards who settled in southeastern Tennessee and in Buncombe County, North Carolina, which is a bit outside of the scope of this post. Future posts will take a closer look at Andrew Ballard, who named a son Whitson, which seems a corruption or variation of “Winston,” a name used in the family of Micajah Ballard who lived in Campbell County, Tennessee and removed to Lawrence County, Ohio. A Winston Ballard appears on a tax list in Anderson County, Tennessee in 1837 (one line away from a Joseph Ballard), on the Federal Census in Campbell County in 1830 and 1840, and he appears to have removed to Greene County, Illinois by 1850. Curiously, the Greene County Illinois census enumerator failed to list the ages of anyone in that household, though he noted that they were all born in Tennessee except the last, Sarah, who was born in Illinois (the list included Winston R. Ballard; Isabel; James; Emeline; Mary Ann and Sarah). Also in Campbell County, Tennessee was a Richard Ballard who married Frances James, the daughter of Rolling James. And there is a Ballard family in Roane County, Tennessee we have yet to study. There is still much to do here. Many thanks to Amy Mays Emert for the work she undertook on our behalf at the Knox County Archives. ← James E. Ballard of Ray County, Missouri (1817-1893). Whilst having no direct interest in the genealogy of this line I felt compelled to read your report – perhaps the Cherokee connection piqued my interest? Anyway, may I say what a pleasure it was to read such a well presented, well researched & well argued account. I shall have to revisit some of my own research now & ensure that it is as well laid out! Thank you, Paul! My interest is two-fold — first, the exoticism (and uniqueness) of it all, and secondly, my two closest matches in the Ballard DNA Project descend from Samuel Ballard, so I figured it was in my best interest to really get into the weeds.